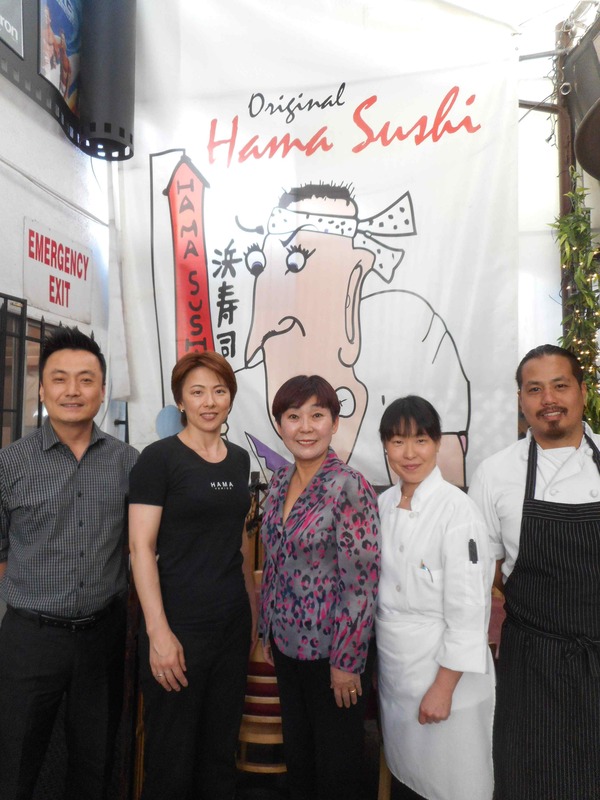 Tony Kim, Naoko Matsumura, Esther Chaing, Masayo Onuki and Than Le of Hama Sushi. A fundraiser for the Venice Japanese American Memorial Marker will be held on Wednesday, April 27, at Hama Sushi Restaurant, 213 Windward Ave., “on the circle” in Venice. Program with speakers and presentations from 11 a.m. to 12 p.m., lunch (eat in or take out) from 12 to 2 p.m., dinner from 6 to 10:30 p.m. The $20 bento box lunch includes chicken teriyaki, cucumber salad, edamame, spicy tuna and California rolls, shrimp and vegetable tempura, plus water or soda. Vegetarian option available. Curbside pickup of bentos during lunch hours is available. Call (310) 717-3393. All bento profits go to VJAMM; 10 percent of all dinner sales will be donated to VJAMM. For dinner reservations, call (310) 396-8783. For those who are unable to participate but would like to support VJAMM, tax-deductible donations can be sent to: Venice Arts Council/VJAMM, P.O. Box 993, Venice, CA 90294. Make checks payable to “VCHC/VJAMM.” The Venice Community Housing Corporation serves as a fiscal sponsor for the Venice Arts Council and VJAMM. The VJAMM) will be installed on the northwest corner of Venice and Lincoln boulevards. The 9′6″-tall solid black granite obelisk marks the spot where some 1,000 persons of Japanese ancestry from Venice, Santa Monica, and Malibu lined up with only what they could carry in April 1942. Buses transported them directly to the Manzanar camp. For more information, including a list of donors and supporters, visit www.venicejamm.org.